A crucial math skill that kids need to master is that of measurements. From being able to measure accurately to forming estimations, there is a lot to measurements that kids need to learn with each passing grade. 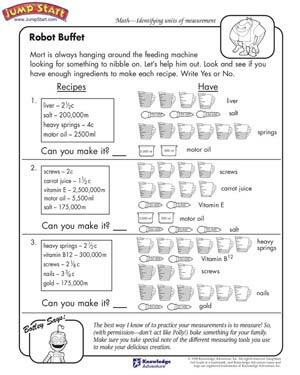 ‘Robot Buffet’ is a fun exciting worksheet that requires kids to measure different ingredients to check whether there is enough to make a yummy recipe for hungry Mort!